Setting The Record Straight. I DON'T Sell Drugs!! "Diversity is the very essence of this country. Diversity is what makes our nation unique and in many ways richer. Bloggers in many ways have a moral responsibility to use their social media power to help their communities. As community bloggers we need to make an effort and use our abilities and strengths to help people from different races and cultural backgrounds come together. We have the power to change the world. Let's educate our respective communities about tolerance, and acceptance and make prejudice, and racism a thing of the past." 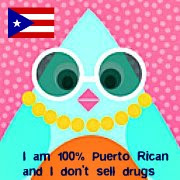 A Puerto Rican entity PRAA (Puerto Rican Alliance for Awareness) posted on YouTube a video in response to the much criticized "Work It" episode, in which one of the characters, Amaury Nolasco joked with the stereotype that Puerto Ricans sell drugs. The Puerto Rican Alliance (PRAA), is a nonprofit organization based in Chicago that exemplify the diversity of the Puerto Rican community clarify that they do not sell drugs. According to the PRAA, founded by Carlos Jimenez and Darlene Vazquetelles, the aim of the video is "to educate the world about the true face of Puerto Ricans, both on the island and in the continental United States." In the second (and last) episode of the series on ABC, whose parent company is Disney, the character of Nolasco, 'Angel', says that being Puerto Rican would be very successful selling drugs. "Work It" was canceled after the second delivery, not only because of the uproar that caused the stereotypical comment, but also because the series of two men dressed as women received the veto of gay and powerful organizations - to boot - was a failure of hearing .